Editor's Note: The Crystal Ball is taking a break for the July 4 holiday next week. So we will not publish on Thursday, June 29. We'll be back on Thursday, July 6. Have a safe and pleasant holiday. A new book tells the story of a president who made his name as an entertainer and a Democrat before moving to the Republican Party and then launching a bid for the presidency. This candidate won his party's presidential nomination despite objections from some party stalwarts that he was unelectable in the fall. He then captured the presidency in part because he was able to perform better than Republicans typically do in some traditionally white, working-class areas in key states. This description applies to the current president, Donald Trump, but the book itself is actually about Ronald Reagan. 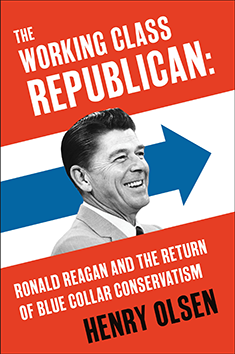 The Working Class Republican, an intriguing new book by Henry Olsen 1, argues that Reagan was less conservative than is commonly acknowledged, and a close examination of his campaign message and time in office provides a model for Republicans going forward. In fact, Olsen argues, Trump mimicked Reagan in some ways. But now Trump is in danger of squandering his Reaganesque coalition, Olsen says, because unlike Reagan, Trump may be governing too far to the right. Olsen, a senior fellow at the conservative Ethics and Public Policy Center, argues that even as Reagan moved from left to right throughout his time in public life, he did not deviate all that much from his ideology as a young New Dealer in the 1930s and 1940s, when he vigorously supported Franklin Delano Roosevelt, a man Reagan idolized his whole life. Reagan's criticisms of government had more to do with opposing what he saw as the leftward drift of Democrats on both opposition to communism and support for bigger government, as exemplified by Lyndon Johnson's Great Society. Despite making one of his most famous political speeches on the eve of the 1964 election backing Barry Goldwater, Reagan did not go as far as Goldwater in his own ideology. Instead, Reagan accepted the New Deal and allowed a role for government programs such as Social Security and, eventually, Medicare (part of Johnson's Great Society, which Reagan rebuked) even while criticizing a government that he saw as too big and too unresponsive to the people. In Olsen's telling, Reagan occupied a position on the center-right, with contemporaries such as Goldwater and supply-side economy acolytes like David Stockman (Reagan's one-time budget director) to his right and the Democratic Party to his left. “In short, Reagan was against returning to the America before the New Deal. He was for interpreting Roosevelt's legacy in a way that maximized freedom and minimized bureaucratic control and the direction of Americans' lives,” Olsen writes. But our point here is not to litigate Reagan's legacy; rather, it's about how both Reagan and Trump peeled away some traditionally Democratic voters in winning victory. To understand that, it's important to drill down on an important swing group in American politics -- a group that Reagan, and then Trump, cultivated. A common and defensible way to measure political ideology is to think of it as a single scale on a straight line, with “liberal” on the left and “conservative” on the right. But reality is a little more complicated than this. Even though the two parties are increasingly ideologically cohesive, with Democrats generally representing the liberal, left-wing position on most issues and Republicans generally holding conservative, right-wing positions, that does not necessarily mean that voters themselves always fall neatly into these consistent ideological boxes. The lower left corner represents liberals -- people who are left of center on both economic and social issues -- while the upper right corner represents conservatives -- people who are right of center on both economic and social issues. But then there are two other groups. The sparsely-populated lower right-hand corner is for libertarians, who are economically conservative, socially liberal. Notice how few dots land in that quadrant, which puts a cap on the Libertarian Party's potential base of support. 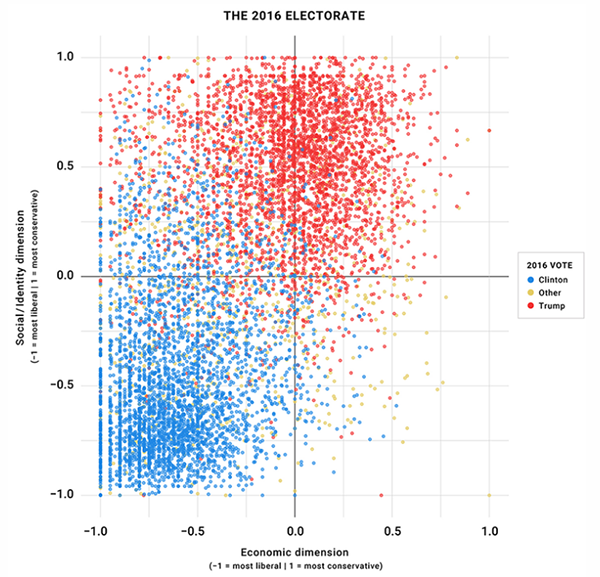 The much more densely-packed upper left corner is for voters who are economically liberal and socially conservative. These “populist” voters, Drutman finds, were already likelier to be Republicans than Democrats: Mitt Romney won these voters in 2012. But they shifted even further toward Republicans in 2016, backing Trump over Hillary Clinton by a three-to-one margin. Clinton only held onto six of 10 populists who voted for Barack Obama in 2012. In a different era, these kinds of voters were known by the term “Reagan Democrats.” Reagan's victories in 1980 were fueled by victories in white, working-class areas like Macomb County, Michigan, the place Democratic pollster Stanley Greenberg associated with the Reagan Democrats in the 1980s. Trump did well in many white, working-class areas across the Midwest, allowing him to narrowly carry a few key states that hadn't gone Republican since they supported Reagan's heir, George H.W. Bush, in 1988 or, in the case of Wisconsin, hadn't voted Republican since Reagan's 1984 reelection. Note that while there's a similar distribution of voters both above and below the horizontal line representing views on social/identity issues, the center of gravity on the economic questions is to the left. This is yet another confirmation of an oft-made observation about the American electorate 5: While voters are “symbolically conservative” (and thus there are more self-identified conservatives in the electorate than self-identified liberals) they are “operationally liberal,” meaning that the public's actual positions on individual issues, particularly as they pertain to the size of government and government intervention in the economy, tend to skew to the left. The ideological challenge for both parties, then, is for a culturally liberal Democratic Party to secure enough of these voters to win nationally by appealing to their economic sentiments, while the economically conservative Republican Party needs to sway them by appealing to their cultural conservatism. It can be easier to do this with a GOP candidate who is perceived as being not as far to the right on preserving popular government services. Reagan sloughed off so many attacks on him by Democrats that he was a heartless government cutter that some nicknamed him “the Teflon president.” Trump had a little Teflon on him, too, given his ability to win the presidency despite monumental personal baggage, but he also did himself a favor, in Olsen's reckoning, by defending Social Security and Medicare on the campaign trail and campaigning on an anti-trade message that in some ways made him sound like a Democrat. Not being maximally conservative on economic issues gave both Reagan and Trump the opening to make their pitch to voters, and both emphasized a nationalistic cultural conservatism that played to populist voters. Reagan expressed this through a dual opposition to the post-FDR Democratic Party and the communist Soviet Union, Trump through attacks on elites and immigrants. Once in office, Reagan's domestic-issue record was ideologically mixed. He presided over big reductions in the top tax bracket, but also signed several tax increases and expanded the Earned Income Tax Credit, which helps lower-income voters. He did not conduct a full-on assault on social safety net programs. Today, Reagan is remembered as one of the great presidents of the last century: A recent University of Virginia Center for Politics poll conducted by Reuters/Ipsos 6 found that respondents generally rated Reagan (and John F. Kennedy) as the top presidents of the post-World War II era. Trump, too, is facing cross-pressure from his specific voter base, which is reliant on economically liberal, socially conservative “populists,” and Republican Party stalwarts, who are more uniformly economically conservative (in fact, it seems clear that the GOP is more ideologically to the right now than it was during the Reagan years -- for more on that, see the book 7 Asymmetric Politics by Matt Grossmann and David Hopkins). While Trump can get by on being more conservative than his campaign persona on many issues, health care looms large as a key issue for him and Republicans in general. The American Health Care Act, the bill passed by the House that is now being considered by the Senate, is very unpopular: Its popularity is likely underwater in every state, and deeply so in most, according to a New York Times Upshot analysis. Writing in American Greatness, a new journal that defends Trumpish conservatism 8, Olsen argues that the GOP is falling into an old, familiar trap in how it is approaching health care, echoing sentiments he expressed in The Working Class Republican. Olsen notes how more Americans have identified as Democrats than Republicans ever since the New Deal. “It's not hard to figure out why Democrats have out-polled Republicans for that length of time,” Olsen wrote. “For years the polls have also shown that the GOP is viewed as the ‘party of the rich' and the Democrats as the party that will give the working person a hand up.” He adds: “Democrats often like to charge that Republicans cut programs that benefit the average person to finance tax cuts for the rich: the AHCA lets them do that with impunity.” The bill, in other words, fails Olsen's “truckers and cashiers” test. Trump has largely outsourced the creation of the AHCA to the House and Senate, leaving House Speaker Paul Ryan (R, WI-1) and Senate Majority Leader Mitch McConnell (R-KY) to craft the bill. Say what you will about the House and Senate leaders, but they are more ideologically conservative on economic matters than candidate Trump was -- and probably Reagan, too. In his conclusion to the book, Olsen speculates about how Reagan might have dealt with the Affordable Care Act. He argues that Reagan would have wanted to repeal it because of its rules and regulations, but he also would have wanted to preserve the ACA's expansion of health insurance coverage. “I can't imagine Reagan would be more concerned about money than about life,” Olsen writes. Trump seemed to be channeling Olsen's Reagan last week when he reportedly told 9 Senate Republicans that the House version of the AHCA was “mean,” even though Trump publicly celebrated when the bill passed the House. Trump said he wants the bill to be “generous, kind (and) with heart.” Whether the bill that eventually emerges and/or passes is that, or whether Republicans can persuade the public that it is, remains to be seen. If Trump and the GOP cannot, though, they may find that Reagan's “Teflon” does not cover them.